Call out bright ideas with appropriately bright color. 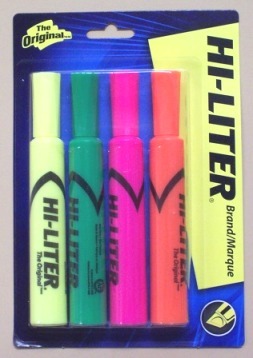 With this HI-LITER set, you can mark key words and phrases with brilliant fluorescent yellow, pink, green and orange that are nontoxic. The molded chisel tip lets you highlight or underline, and the durable plastic tip won't fray or mush. A faceted barrel provides a comfortable grip, so you can wield the highlighter with ease as you mark documents, notes, books and more. And, the improved formula means you can leave the cap off for up to a week and still highlight with ease. Trust the original highlighter. We're sure you'll appreciate just what a bright idea you've discovered.